Jenny Barnes arrives in the heart of the Egyptian capital of Cairo in pursuit of the Brotherhood of the Black Pharaoh. Craving a good and engaging game, UB and BT sat down to have a go at the new AH expansion by UB based on the Egyptian capital of Cairo. We are planning using this expansion as part of a campaign, along with new characters and several other players, so we decided that this particular game would be a test drive. The last time we played Cairo Horror, indeed the only other time we have played it, UB, BT and JT spent hours combing through the minutiae of rules and conflicts with existing rules. Despite de-powering the Djinn, the town of Arkham remained so busy, that only one of us got to even visit Cairo. This time would be different. OBJECTIVE: Play through as many Cairo elements as possible. Agreed to bend and twist the through-line of the game if it was hampering access to Cairo. Rather than try and figure out the complex solutions to every problem, we'd simply note them down and play through them, or create a quick make-do suggestions to keep the game flowing. We played a 'double hander', of four investigators between two players. 1) Arkham needs to be down-powered. The simple act of sending one investigator over to Cairo put pressure on defending Arkham. We were rapidly overwhelmed. Admittedly, we started the game with only only Dexter having one weapon (Shrivelling) and sent Jenny off to Cairo with all the money to buy gun. Solution: Rather than the first gate opening being used as the vortex to Cairo, it remains only the principle gate. Following that, ALL other gates also lead to the Cairo Vortex. In effect, and unlike the other expansions which are accessed by conventional travel, Cairo serves the same role as an Other World, only it take an entire game rather than 3 turns to resolve. Because it is in part Nyarlathotep as the Dark Pharoah, incarnating and attacking the world from Cairo, he is dominating the influx of mythos related forces, and is particularly assailing Arkham because his agents are trying to secure artifacts from the Exhibit. This way, all roads lead to Cairo, and no gates can be closed/sealed without completing the Cairo Horror expansion. Completing the Cairo board means sealing any open gates, and potentially winning the game. Solution: Treat the game as if it were two board expansions. 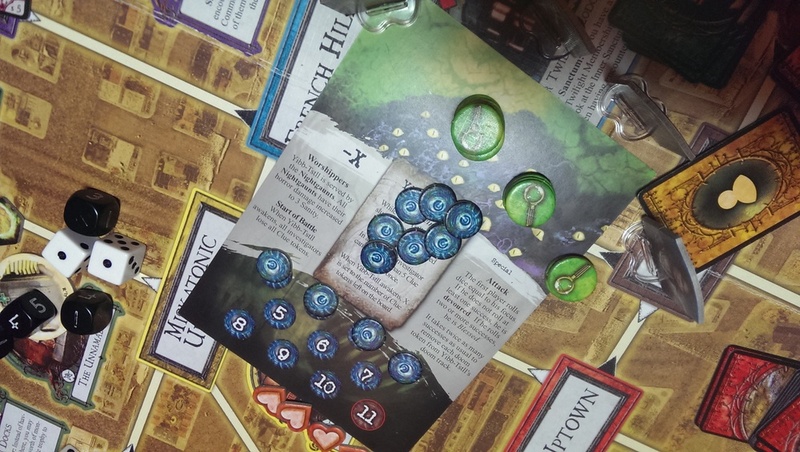 By 4 on the Doom Track, because we had not been able to kill ANYTHING, and because of the influx of monsters from the Cairo Vortex arriving in Arkham (not counting against the monster limit) the whole town became gridlocked. It was terribly terribly hard. Unrelentingly grim. Every single of the Arkham monsters were really hard 'big fights' like Dholes and Star Spawn, and Shoggoths (we play 'big games' with a Monster Cup of all monsters, except Masks played as usual - just because it is way too tiresome to figure out what monster went where) . Extremely hard if the best weapon you have is a Shrivelling and a Holy Water followed by a cross in your party of four. Hank wades in: Wraith, Leng Spider, Shoggoth, Shoggoth, Proto-Shoggoth. Then there was the rumor. The Terrible Experiment: The one about fighting a bunch of monsters, which are added to every subsequent Mythos. And we had no weapons. And they were all horrid monsters. Not a maniac, child of the goat or cultist among them. Just utter horror. But we knew if had to be resolved, or we would, very soon face a Terror Track raised from 1 to 10, and no monster limit. Hank dived in and was supported by Dexter in the adjacent Science Building, granting a plus from their Best of Friends relationship. Planning on taking as many as possible, Hank launched into his frenzied attack against the first opponent: a Wraith. The unique ability is to delay the Horror check until he has failed his combat. Given this, Hank had entered the fray with the confidence of a man not planning on losing the combat, had his fight bumped up to its max of 5. His combat was 12 dice (14 -2) for three toughness of hits. He got a single hit out of all 12 dice. Shocked at losing the combat, Hank had to pass his Horror Check. With a roll of zero, he took all of the damage on the chin and settled for a rematch. 12 dice again, but this time Hank threw in all 7 of his clues (being saved for a gate seal), his Best of Friends bonus, and some other stuff I can't recall, and finally nailed all three successes he needed. The fight had not gone to plan. The next fight came along: a Leng Spider. A short but risky fight, resolved before he had to retire. In the next turn, Hank retreated and Dexter stepped up, armed with his now delightful brass knuckles, his +1Fight skill, Voice of Ra for +1s, and his newest bestest buddy Tom Murphy (+2Fight). His base fight had been maxed to ensure the highest Will for his Horror Check, leaving him with +1 on that, for a total Combat figure of 5, minus whatever the monsters had. He had five clues. Only, Hank had not merely run off in shame, but had run to his only place of refuge, the Southside Church, and there, with all of his Monster Trophies, he prayed for Dexter to be Blessed. A now pumped up and divinely inspired Dexter wadded in. Ripping off his Shrivelling killed the first monster before it was exhausted. From then on his fists happened, as he scraped through fight after fight, until the gory entrails of all the remaining monsters began to congeal about the hemline of his fine trousers. Somewhere in the viscera the players could make out the remains of 2 Shoggoths, a Proto-Shoggoth, devouring Shan and a Leng Spider. Dexter Drake almost always the unbidden 'man of the match' out did himself yet again. We were playing for almost 11hours, and it was late in the morning by the time we finished, our sanity in tatters. The Best of Friends pose for a quick team photo after clearing the rumour in two turns, killing 6 monsters for a total of 15 blood points. When the final fight against the Ancient One Nyarlethotep arrived, as we by now chewed our way through the Doom Tokens we decided to pimp Dexter as much as possible. At his side stood Tom Mountain Murphy, with Professor Armitage delivering his +2Lore AND his Ignores Magical Resistance. His Shrivelling (+6) was aided by his Brass Knuckles (+1), an Alien Device (+2), Tom (+2), and his base Fight maxed (+4). Also he was blessed. There was clearly a bunch of other stuff, because he did 16points of damage with his first hit. The rest was a formality, with now Battle Conditions, and us surviving two Sinister Plot cards... epic all the way. Thomas F. Malone and Ryan Dean both succumb to the corrupting promises of the Ancient One and turn against the investigators. Having just finished a four investigator / two player game against Azathoth, I want to present an exciting little development we would encourage players to consider occasionally using. First up, Azathoth is a much neglected Ancient One (with our group of players at least) because it does not have a final battle, and barely modifies the basic game. This initially means that as an Ancient One, it serves as the 'baseline' from which others are created, as indeed, the spinning babbling vortex of insanity at the centre of the Mythos pantheon, it really should be. However, by not having a final battle, an enormous emphasis shifts. The game must be 'won' in Arkham, and the Investigators are never building themselves up for an as-yet unfought final battle. That makes everything a little more immediate in regards to game play. With this particular game we broke it in the first two turns with some extremely lucky gate closings and seals instantly knee-capping the board and preventing many monsters from coming out. The fact that we won the game with gate closures, three Elder Signs, and only 6 of a possible 14 doom tokens on the track seemingly proves the value of the tactic: close and seal gates immediately to cripple the board and win. 1) When the Terror Track goes up the first time (or when you are around half way through the Doom Track) draw at random an ally to discard (as standard). 2) However, add the ally to a Maniac (drawn from the cup), and place on the location which features that ally (eg, Prof. Armitage at the Historical Society, Duke in the Woods). The ally has basically flipped out and 'gone dark'. 3) Treat this rogue ally as a Maniac for the purposes of movement, and using the base (advanced) stats of the Maniac. If the ally-maniac moves from their starting location (ie into the streets) then move the Terror Track onwards, and draw another ally. Sneak = makes Maniac, evasive. Luck = hmn... not sure about that one. Equivalent to being cursed for the purposes of combat against this enemy? Max Sanity = Extra Horror damage. 5) If the ally normally grants the investigator any items upon joining them, those items are claimed after the combat is won. However, in order to claim them, the player must pass a luck check or be cursed by the item. 6) If the ally-maniac is unable to enter play due to the Monster Limit, they do not move to the Outskirts or the Box, but are added to the Ancient One's card, where they will play against the investigators serving either as simple Bound Allies, or for more excitement, they will modify the Ancient One with their own modifiers, if it is obvious how to do so. We had great fun playing this little mechanic, especially because when it is only UB and BT playing, we invariably amp-up the role-playing aspect, and having named foes adds to the personal nature. It is worth considering how this dynamic will thematically stack with the Blight cards from the King in Yellow herald pack.